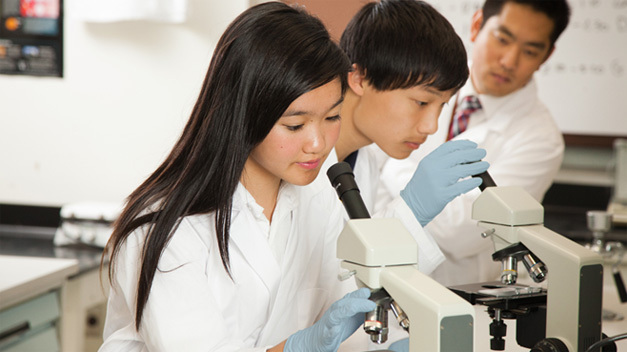 At California Crosspoint Academy, we take learning very seriously—and our academic record shows it. A full 99% of our graduates have gone on to college, with the rest entering the military. CCA regularly has students named as National Merit Scholars, which puts them in the top 1/2 percent of eligible students nationally. CCA has also been awarded twice the U.S. Department of Education’s Blue Ribbon School of Excellence award, the highest educational honor in the nation, in 2003 & 2016. You might be wondering how such a small private Christian school can achieve such consistent academic performance. Here’s how: our academic standards are rigorous. We challenge our students to work at the highest level possible so they can enter the college of their choice and have the tools they need to discover their passion and pursue the career that suits their God-given talents. Our highly qualified teachers and staff love their work, and our small classes give them the chance to provide special attention and guidance to make sure each student succeeds academically. Our course catalog is broad and deep, including over 19 Advanced Placement (AP) and Honors courses, so we can meet the needs of all our students. Customized class scheduling allows students to develop a learning plan to reach their goals and realize their potential. College counseling, which lays the groundwork for each student’s academic program, begins as soon as students enroll and is ongoing. We guide students as they consider colleges, prepare applications, and complete college essays, making sure they don’t miss important deadlines. It’s no secret why parents in Oakland, Hayward, Fremont and the surrounding cities choose us for their child’s education. As an award winning private middle school and high school, we will ensure your child has the most beneficial and fulfilling education experience possible. Contact CCA today to learn more about our school admissions process.